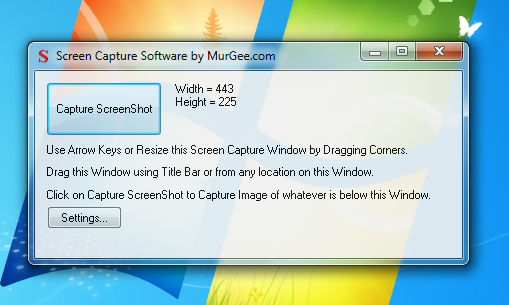 Now capturing Screenshot in Windows is really easy with Screen Capture Software by MurGee.com. This software can be really useful when you do know the area of the screen which you wish to capture. This Screenshot software allows you to capture screenshot of any portion of screen using a resizable & relocatable semi transparent window (with transparency control settings). The software has a single button to capture the screen area under the screen capture window. Yes this software works fine on Windows 8 as it works on Windows 7, Vista, XP or even on Windows 2000. Do have a look at the screenshot of the software below to know how it looks like and what control settings are available to control this nifty utility to make the task of creating screenshots really easy and handy. Download and try out this Screen Capture Software on your Windows 8, Windows 7, or any other windows version and try it out for free. This Screen capturing software allows you to define the rectangular area for capturing the screenshot and then you can capture the screenshot. The captured screenshot is stored automatically on your hard disk with appropriate name. This software utility also opens up the folder in which the screenshot captured has been stored. This small Screen Capture utility has information messages on its user interface, a settings button and a button to actually Capture the Screenshot. In order to capture the screenshot, just move the window on top of the screen location which you want to be captured and then click the button labelled Capture Screenshot. This Screen Capturing utility will minimize automatically, capture the screenshot, store it in your hard disk and will open up the folder using Windows Explorer. In order to get precision changes in window size, you can use arrow keys with focus on this screen capturing software and change size of main window of the software with precision of 1 pixel. Width & Height of the window and hence the screen capturing area is always displayed and updated automatically.